This panel has been the subject of various attributions. Friedländer suggested Jacob van Amsterdam Cornelisz., Franz Düllberg suggested the circle of Lucas van Leyden, and Friedländer subsequently proposed Cornelis Engebrechtsz. It was Colin Eisler in 1989 who finally gave it to an anonymous Dutch painter. The panel has been the subject of various technical studies of which the one undertaken in the 1980s by the restorer Emil Bosshard revealed a layer of underdrawing that is visible in some parts of the painting. As a result, it is evident that the artist made significant changes between the stage of the preparatory drawing and the final painting, particularly in the design of the hands of this unknown sitter, which are painted in a notably schematic manner. The portrait was intended to be shown in a frame with a semi-circular top, as can be seen from the way the area of paint at the top terminates in a rounded shape. This painting was first recorded in the Collection in the 1937 catalogue by Rudolf Heinemann, in which it was attributed to Jacob van Amsterdam Cornelisz., in line with the opinion of Max Friedländer. 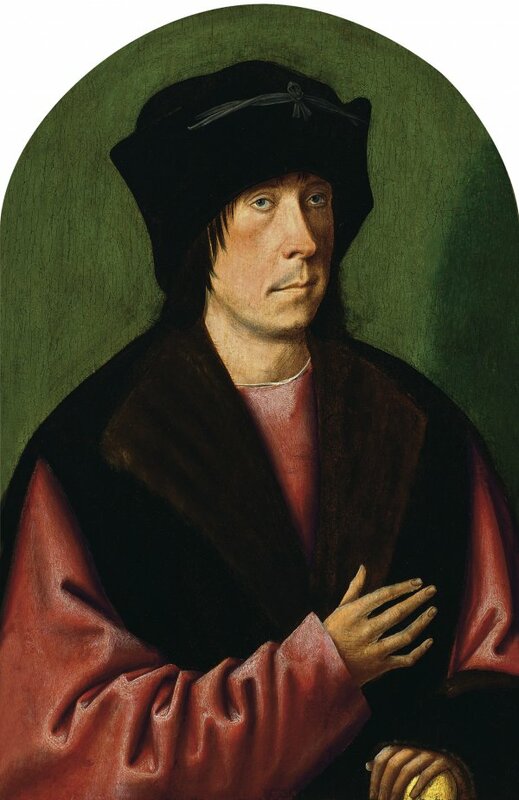 In 1904 Franz Dülberg had described the painting as close to the school of Lucas van Leyden while Friedländer subsequently revised his attribution on the basis of further study and in 1937 gave it to Cornelis Engebrechtsz., the attribution that appears in the catalogues of the present Collection until 1989. That year, Colin Eisler, who wrote the new entries on the Early Netherlandish paintings, catalogued the panel as by an anonymous Netherlandish master. In 1977 in his study of the work of Engebrechtsz., Walter Gibson excluded this panel from his proposed oeuvre. For this reason and others of his own, Eisler catalogued the painting as by an anonymous artist active in the Netherlands, an option that has been maintained since that date. Overall, since it was first presented to the public in an exhibition held in Bruges in 1902 the attribution of this panel has been controversial and complex. In 1980 the panel was the subject of a technical study undertaken at Villa Favorita by Emil Bosshard, the Collection’s restorer at that period. Infra-red reflectography revealed interesting underdrawing, and various small differences are evident with regard to the final painting. This under-drawing, which is visible to the naked eye in some areas, is particularly significant in the areas of the hands and drapery, particularly the right sleeve. The infra-red reflectograph shows how the artist defined the fingers and the shadows of the right hand and sleeve with simple, schematic strokes. It is also possible to see a small pentimento in the thumb. The panel, with its intense green background, has a semicircular upper edge.